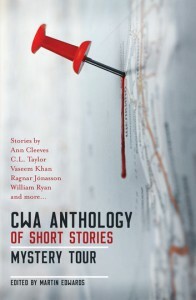 This collection of CWA short stories about various crimes is most enjoyable and by a variety of thriller writers including Ann Cleeves and other well-known authors. The stories are gathered under the theme of travel and, as one might expect from a collection of short stories, some are better than others – or rather more pleasing depending on the individual's taste (for example, I particularly enjoyed the last one by William Ryan). I read these between full novels as a nice short alternative and I recommend them to all lovers of crime fiction.